These rules are meant to be applied to all BPONG Sanctioned events. 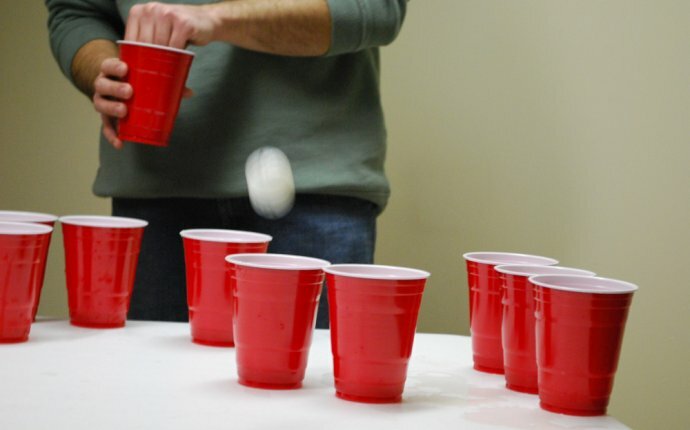 However, some elements of these rules are specific to The World Series of Beer Pong, including Tournament Structure, etc. When an event uses a format that is different than that of the WSOBP, discretion on the part of the organizers should be used to apply these rules. Prelims will take place on the first two days of the event (January 2 and January 3) Each team will play 6 games per day (for a total of 12 games) during prelims. Opponents will be chosen randomly. For each game in prelims, one team will have choice of table side, and the other team will have choice of first possession. Each team will receive a schedule of their preliminary opponents. The schedule will indicate which team has choice of possession and which team has choice of table side. After each game in prelims, a scorecard must be filled in and signed by a member of each team. The scorecard should be filled out with the following information: name of the winning team, name of the losing team, round number, table number, and the number of cups remaining on the losing team's side. In the event of a forfeit, an 'F' should be placed in the "remaining cups" section. At the conclusion of prelims, all teams will be ranked, first by number of wins, and then by "Total Cup Differential". "Total Cup Differential" is defined as the sum of the "Cup differentials" for all games actually played. For each game played, the winning team receives a "cup differential" equal to the number of cups remaining on the opponents side. The losing team receives a negative "Cup Differential" for each cup remaining on his side. In the event of a forfeit, the forfeiting team receives a Loss and the opposing team receives a Win. Each team will receive a cup differential equal to the average cup differential of the rest of their games. In the event that the winning team has a negative cup differential, they will receive a cup differential of 0 for the game. In the event that the losing team has an average cup differential higher than -3, they will receive a cup differential of -3. Any game that is won in overtime (or any successive overtime) will be counted as a cup differential of 1. Finals will take place on the third day of the event (January 4). The highest ranked 160 teams will qualify. The lowest ranked 64 teams will face off against each other in a single game (aka the "play-in" round). The 32 teams that survive will be joined with the 96 teams who had a bye yielding 128 remaining teams. The remaining 128 teams will be broken down into 16 groups of 8 teams. Each group of 8 will enter into a "double-elimination" bracket. The 16 teams that win their brackets will be split up into two groups of 8. Each group of 8 will enter in a "double-elimination" bracket. The two teams that survive will face off in a "best-of-3" finals. There will also be a single game for third place. If there is a tie for 160th or 96th place, ranking will be determined by a strength-of-schedule calculation. In the event that a tie still remains at the end of day 2, tiebreaker games will be held. For additional local solar energy uses visit mainrenewableenergy.